Snorkeling Hapuna Beach can be fun. It is one of the most beautiful beaches on the Big Island, and is often listed as one of the world’s top ten most beautiful beaches. It has wonderful golden sand, and is long and wide (over 200 feet wide). Every time we are here it is busy. Once we could not even find parking. Also, the Hapuna Beach Prince Hotel is situated on the north end of the beach. The snorkeling is good at either end around the rocky points. The visibility is often lower than other snorkeling locations around. This beach is also more exposed than others nearby, so the waves can get big which can make snorkeling Hapuna Beach dangerous. These things combined with a relatively long swim to the live coral reefs make this location for more advanced snorkelers. 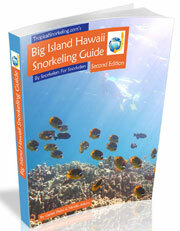 Like most places in Kohala, conditions are usually best for snorkeling in the mornings. This nice sandy beach makes the water entrance super easy. Just walk to the end of the beach you intend to snorkel and get in. Do not snorkel if the surf is up; leave this location to the boogie boarders and head elsewhere. You can snorkel either end of the beach. They both have a pretty long swim to get to some corals, but you will see more in the shallows on the north/right end. The corals on both ends are on the very exposed rocky points, so watch for currents, surge and waves. The north side of the beach is better for turtles and there are lots of fish in the rocky shallows. Follow the rocky wall and canyons out to the point. The corals on the wall are fairly healthy and there are many urchins here. The fish continue to be numerous as you get toward the point, but the water visibility is not high. The depths range from a few feet near the beach to 25 feet or so around the point. Watch for currents when you pass the point and turn back to the beach before you are tired. To get to the coral reef and fish you must swim a good distance on the south/left end. We swam next to the rocks on the way out. We did not see anything but a couple of fish the entire swim out. But, once you get out to the first point you come into a small bay. And in this bay there are some wonderful coral formations and tons of fish. Unfortunately, the visibility was not very good here either. The depths range from a few feet near the beach to 30 feet or so in the bay. These waters are unprotected, so keep a careful watch on the weather, waves and currents. You are also out of sight of the lifeguards once you go around the point. Again, turn back long before you feel tired. 1. From Kailua Kona, take highway 19 (Queen Kaahumanu Hwy) north out of Kona. Follow it through the Waikoloa Resort Area, past the Puako Road turnoff and mile marker 70. 2. Watch for the big “Hapuna Beach” sign and turn onto Hapuna Beach Road on the left near the 69 mile marker. On weekends plan on coming early to get parking. There is a parking fee of $5 per vehicle. The park has all the facilities you could want: showers, restrooms, drinking water, picnic tables, picnic pavilions, lifeguards, camping cabins you can rent, and even a nice little beach restaurant (the Paradise Grill) - with reasonable prices. There is plenty of shade, and lots of trees behind the beach.